Next month, phones running Windows Phone 8 should finally hit store shelves, following the official release of Microsoft’s new smartphone OS on October 29. Some may think this means the end of Windows Phone 7, the OS that preceded it, however Nokia thinks it still has legs and has announced a new phone to prove it. The Lumia 510 is an entry-level phone using Windows Phone 7.5 as its operating system, and although its model number suggests it slips into Nokia’s range below the Lumia 610, the 510’s spec trumps it in one key area — the screen size. Nokia has given the 510 a 4-inch display with the same 480 x 800 pixel resolution as the 610, although that device has a smaller 3.7-inch screen. The processor is listed as a Snapdragon S1, which could be the same MSM7227A chip found in the 610, where it runs at 800Mhz. Phonearena.com’s spec list indicates that this is indeed the case. There’s 256MB of RAM, which will mean some apps won’t operate on the phone, 4GB of internal storage memory and 7GB of free cloud space with Microsoft’s SkyDrive. Mounted in the center of the colorful rear panel is a 5-megapixel camera, which can also shoot VGA video. The spec list continues with GPS along with Nokia Maps and Nokia Drive, an FM radio, Bluetooth 2.1, Wi-Fi, a 3.5mm headphone socket and a 1300mAh battery. Designed to sit in-between its Symbian smartphones and the latest Lumia 820 and Lumia 920 Windows Phone 8 handsets, the Lumia 510 is an affordable introduction to Microsoft’s still-growing OS. Nokia will initially release the phone in India and China during November, then bring it to South America and other countries soon afterwards. 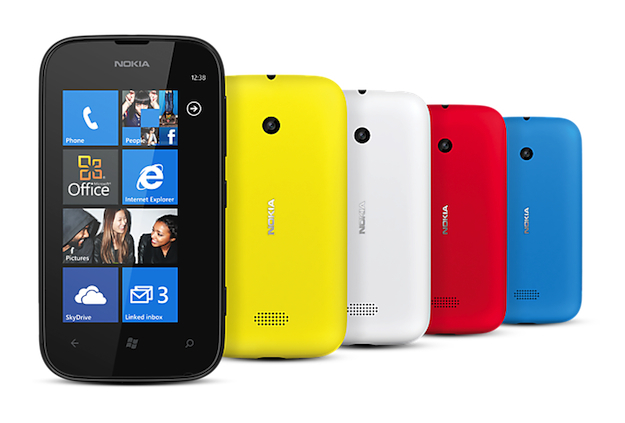 Available in white, black, red, yellow and cyan, Nokia has priced the Lumia 510 at $199.